The Duke of Edinburgh’s International Award in Nigeria recently held its first Supervisors and Assessors Training (SAT) for Award Leaders from various institutions and organizations currently delivering the Award in Nigeria. The training aimed at equipping the Award Leaders with the knowledge and skills to effectively deliver the Adventurous Journey section of the Award successfully, from the training of participants to the final venture, and to prepare them to act as Assessors for the Qualifying Adventurous Journey at Bronze, Silver and Gold level. 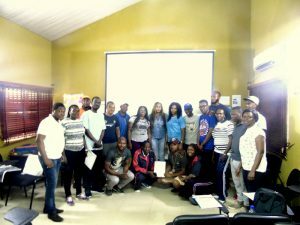 The three day training which was attended by Award Leaders from various states in Nigeria was held at the National Award Office in Lekki, Lagos and also involved a practical Adventurous Journey which took place at the Lekki Conservation Centre. The training which involved sessions that tested the participant’s knowledge of the Adventurous Journey, introduced the participants to the various roles involved in an Adventurous journey, the essence of training young people before embarking on an Adventurous journey, training on how to map a route by the use of a compass, basic necessities and safety during an Adventurous Journey, risk assessment and management. 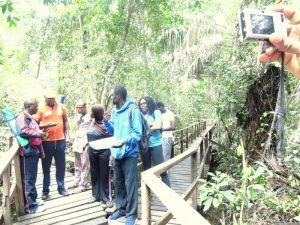 For the practical Adventurous Journey session at Lekki Conservation Centre, the participants were formed into different groups and were acquainted with the necessary navigational tools required for the Journey, its planning and preparation. This was then followed by a presentation session for the participants where they displayed what they had learned from their exploration of the Conservation Centre. The Duke of Edinburgh’s International Award which was founded in 1956 by HRH Prince Philip, operates in Nigeria under the name The International Award for Young People Nigeria and is available to all young people aged 14 to 24 years equipping them irrespective of their background, circumstances, challenges and abilities. The Award has three progressive levels: Bronze, Silver and Gold level and has four sections designed to provide young people with a program of activities for personal development such as: Community service, Skills, Physical recreation and Adventurous Journey with an additional Residential project at Gold level. The Adventurous Journey is a section of the Award which aims at encouraging a spirit of adventure and discovery whilst undertaking a journey in a group. It is the section of the Award which young people find most exciting and interesting. It gives a sense of achievement and takes young people out of their comfort zone impacting values like: teamwork, leadership skills, self-reliance, communication skills, develops their confidence level and appreciation for nature etc. Speaking to the Guardian Newspaper, one of the Award Leaders disclosed that” the training experience has been exciting, adventurous and mind-blowing and such knowledge will sharpen him to meet present and future challenges, an opportunity most teachers never had in their days. “The training will make him a better teacher, Award Leader and parent”. The International Award for Young People Nigeria is delivered in over 110 institutions and organizations across Nigeria and over 12,000 young people in Nigeria have participated in the Award till date and they look forward to reaching more young people in the years ahead. The training of Award Leaders is very essential to the growth, sustainability and quality delivery of the Award in Nigeria. Older PostComing Soon…..(ORB) Next Gen!